Our biological connection and dependence to the sun is so profound, that the very variation in human skin color from African, melanin-saturated dark skin, to the relatively melanin de-pigmented, Caucasian lighter-skin, is a byproduct of the offspring of our last common ancestor from Africa (as determined by mitochondrial DNA) migrating towards sunlight-impoverished higher latitudes, which began approximately 60,000 years ago. In order to compensate for the lower availability of sunlight, the body rapidly adjusted, essentially requiring the removal of the natural “sunscreen” melanin from the skin, which interferes with vitamin D production; vitamin D, of course, is involved in the regulation of over 2,000 genes, and therefore is more like a hormone, without which our entire genetic infrastructure becomes destabilized. 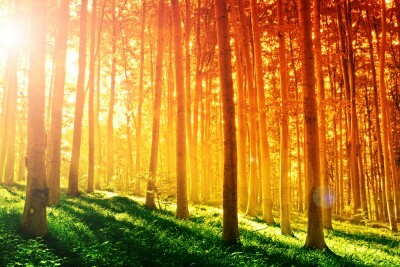 While the health benefits of vitamin D are well-documented (GreenMedInfo.com has identified over 200 health conditions that may benefit from optimizing vitamin D levels: Vitamin D Health Benefits page, and Henry Lahore’s Vitamin D Wiki has far more), the therapeutic properties of sunlight are only now being explored in greater depth by the research community. 2) Sunlight Burns Fat: A 2011 study published in The Journal of Investigative Dermatology revealed a remarkable fact of metabolism: The exposure of human skin to UV light results in increased subcutaneous fat metabolism. While subcutaneous fat, unlike visceral fat, is not considered a risk factor for cardiovascular disease, it is known that a deficiency of one of sunlight’s best known beneficial byproducts, vitamin D, is associated with greater visceral fat. [ii] Also, there is a solid body of research showing that vitamin D deficiency is linked to obesity, with 9 such studies on our obesity research page. One of them, titled “Association of plasma vitamin D levels with adiposity in Hispanic and African Americans,” and which was published in the journal Anticancer Research in 2005, found that vitamin D levels were inversely associated with adiposity in Hispanics and African-Americans, including abdominal obesity. [iii] The point? Exposure to UVB radiation, which is most abundant two hours on either side of solar noon and responsible for producing vitamin D, may be an essential strategy in burning fat, the natural way. In the current study we report that those persons conceived and likely born during the peaks (MAX approximately 3 years) of approximately 11-year solar cycles lived an average 1.7 years less than those conceived and likely born during non-peaks (MIN approximately 8 years). Increased energy at solar MAX, albeit relatively a small 0.1% increase from MIN, apparently modifies the human genome/epigenome and engenders changes that predispose to various diseases, thereby shortening lifespan. It is likely that same energy increases beneficial variety in the genome which may enhance adaptability in a changing environment. 5) Sunlight May Convert To Metabolic Energy: If a novel hypothesis published in 2008 in the Journal of Alternative and Complementary Medicine is correct,[vi] a longstanding assumption that animals are incapable of utilizing light energy directly is now called into question. In other words, our skin may contain the equivalent of melanin “solar-panels,” and it may be possible to “ingest” energy, as plants do, directly from the Sun. Melanin has a diverse set of roles in various organisms. From the ink of the octopus, to the melanin-based protective colorings of bacteria and fungi, melanin offers protection against a variety of threats: from predators and similar biochemical threats (host defenses against invading organisms), UV light, and other chemical stresses (i.e. heavy metals and oxidizing agents). Commonly overlooked, however, is melanin’s ability to convert gamma and ultraviolet radiation into metabolic energy within living systems. Single-celled fungi, for instance, have been observed thriving within the collapsed nuclear reactor at Chernobyl, Ukraine, using gamma radiation as a source of energy. Albino fungi, without melanin, were studied to be incapable of using gamma radiation in this way, proving that gamma rays initiate a yet-unknown process of energy production within exposed melanin. Pigments serve many visually obvious animal functions (e.g. hair, skin, eyes, feathers, scales). One is ‘melanin’, unusual in an absorption across the UV-visual spectrum which is controversial. Any polymer or macro-structure of melanin monomers is ‘melanin’. Its roles derive from complex structural and physical-chemical properties e.g. semiconductor, stable radical, conductor, free radical scavenger, charge-transfer. Clinicians and researchers are well acquainted with melanin in skin and ocular pathologies and now increasingly are with internal, melanized, pathology-associated sites not obviously subject to light radiation (e.g. brain, cochlea). At both types of sites some findings puzzle: positive and negative neuromelanin effects in Parkinsons; unexpected melanocyte action in the cochlea, in deafness; melanin reduces DNA damage, but can promote melanoma; in melanotic cells, mitochondrial number was 83% less, respiration down 30%, but development similar to normal amelanotic cells. A little known, avian anatomical conundrum may help resolve melanin paradoxes. One of many unique adaptations to flight, the pecten, strange intra-ocular organ with unresolved function(s), is much enlarged and heavily melanized in birds fighting gravity, hypoxia, thirst and hunger during long-distance, frequently sub-zero, non-stop migration. The pecten may help cope with energy and nutrient needs under extreme conditions, by a marginal but critical, melanin-initiated conversion of light to metabolic energy, coupled to local metabolite recycling. Similarly in Central Africa, reduction in body hair and melanin increase may also have lead to ‘photomelanometabolism’ which, though small scale/ unit body area, in total may have enabled a sharply increased development of the energy-hungry cortex and enhanced human survival generally. Animal inability to utilize light energy directly has been traditionally assumed. Melanin and the pecten may have unexpected lessons also for human physiology and medicine. Tagged Anti aging, sunlight, vitamin D, weight loss. Bookmark the permalink.